When Idiocracy was released in 2006, it didn’t make much of an impact upon the world. In fact, most people didn’t even know it existed. 20th Century Fox had a contractual obligation to release Mike Judge’s follow-up to Office Space, but they pretty much just tucked it away. After being sat on for more than a year, it initially opened in just seven cities, and with practically zero publicity—not even so much as a trailer. 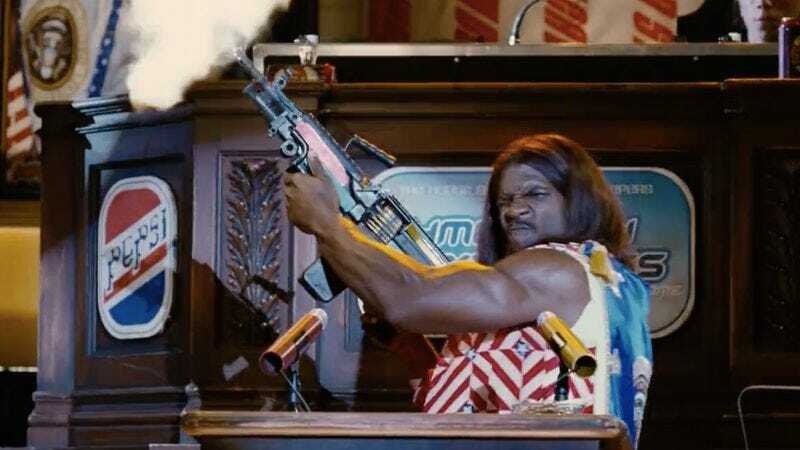 Now, just one decade later, Idiocracy is practically a household term, which is as much a testament to the film’s enduring satirical genius as it is to the country’s terrifying free-fall which includes, among other things, a not-totally-impossible Trump presidency. If you can’t make it to one of the many participating theaters all around the country, Alamo invites you to hit the play button on your own copy at exactly 7 p.m. PT that night, and then watch the post-movie conversation on Alamo’s Facebook Live at 8:25 p.m. Writer-director Mike Judge and co-star Maya Rudolph will be taking questions from the Santa Monica screening, which will be beamed out to all the other theaters and the internet through some kind of a magical device that only super-smart geniuses can understand. You can tweet your questions to Judge ahead of time using the hashtag #IdiocracyToday.